It seems the maximum number of films selected in the Panorama are from Malayalam cinema. The most famous among the 5 selections are Blessey's Thanmatra which featured an amazing Mohanlal performance. Then, there's Saira by Dr Biju, for which Navya Nair won this year's Kerala state award. Also featuring are Madhu Kaithapuram's Eakantham, MP Sukumaran Nair's Drishtantham and Sashi Paravoor's Nottam. Sarada Ramanathan's Sringaram has already been the toast of many international film festivals. TV Chandran is not new to the festival circuit either. He made his first film Aalicinte Maranam in 1989. Mammooty won the National Award for Best Actor for his performance in Chandran's next, Ponthan Mada. Then, Meera Jasmine won the Best Actress award for her role in Patam onnu oru vilapam. He decided to make his latest in Tamil, and the Panorama selection Aadum Koothu has Navya Nair and filmmaker-actor Cheran in the lead. It is a double bonanza for Cheran. His much talked about film Thavamai Thavamirundu also made the Panorama cut. Hope by K Sathyanarayana (also known as Satish), is this year's Telugu entry to IFFI. Based on suicides amongst the youth, Hope is a realistic take on the education system of the country. 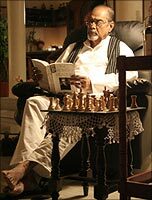 The film produced by Haranath Policherla features Guinness record holding actor-producer Rama Naidu. The background score is by maestro Ilayaraja. Director Satish is "extremely happy and honoured that his film has been chosen." It will be presented on November 28 at the Goa festival, and the director will interact with the audience after the screening. "The moment I penned the first dialogue, I was confident (the film) would make it to the festival. I want to spark off a debate on the education system through the film," Satish said. The film will have a theatrical release in Hyderabad after its presentation in IFFI. Not much needs to be said about the films made by Girish Kasaravalli. One of the most decorated directors in terms of both national and international honours, his Nayi Neralu will also be shown in the Indian Panorama. TV Chandran's first Malayalam film is Aalicinte Anveshanam, not Aalicinte Maranam. It's not his first film either, he made "Hemavin Kathalarkal" in Tamil before that.